"MEISTER DER MODERNE" was held from March 8 to March 14 (2001) at the Messe exposition center in Munich, Germany. Japanese ceramic artist Nagae Shigekazu was invited by the association to exhibit five pieces. 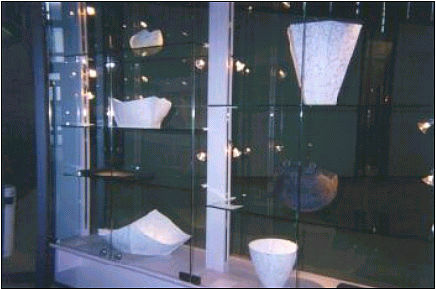 The exhibition was organized by the Munich craft association in order to promote world arts and crafts in ceramics, glassware, textiles, metalworks. This exposition center was built at the former Munich airport. Because of the huge size of the center, I could not find where Nagae's pieces were displayed. I had to ask the receptionist. She looked slightly bewildered and said, "We don't know where they are." I pulled a piece of paper out from my pocket and showed it to the receptionist, "This is a copy of letter which I received from the association for Nagae' works," I said. "We will try to find the exact location of his works," she replied. " You may proceed this way," she directed me, " and ask Mrs. Muller." I walked inside the vast cavern the way she directed and eventually found someone. "Can I speak to Mrs. Muller?" I asked. "Yes, I am she, and are you Mr. Aoyama?" the woman answered. At last, Mrs. Mueller was the person who invited Nagae. She took me to the correct exhibition space where I saw the five Nagae pieces in a brightly lit showcase; the works were shining. Mrs. Muller told me that we were so happy to have Nagae's pieces here and that was one of their dreams. "How did you find out about Nagae?" I asked. She said that she found Nagae's works at the Nyon Triennial, Switzerland. 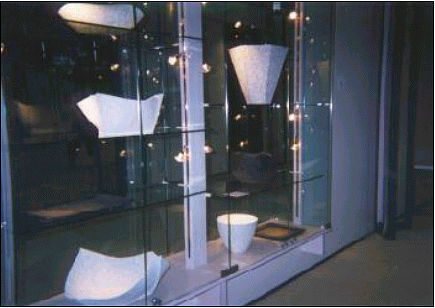 As matter of fact, Nagae won the poison d'or grand prix at the triennial public exhibition for porcelain in 1998. Since he won the grand prix at the Triennial, his reputation in Europe is growing and he received many invitations to have a solo exhibition or to participate in group exhibitions. These included the Galerie le Vieux-Bourg in Lausanne, Switzerland, Galerie Travel-Taylor in Strasbourg, France and Nancy Margolis Gallery in NY, USA. As his representative for activities outside of Japan, I am very pleased to know how his works are accepted. It is one of my goals to have East meet West by promoting Japanese ceramic arts. This in turn will help build the way for cultural exchanges in the field of ceramics.